Calgary Coin offers an extensive selection of Canadian $1.00 and $2.00 coins for sale on the internet and in my store here in Calgary. I usually have most dates available in a variety of grades and prices for collectors at all levels, usually priced at a discount from the Canadian Coin News trend sheet price guide. All Canada silver dollars issued from 1935 to 1967 were 36 mm diameter, 2.8 mm thick, average 23.33 grams of 80% silver and 20% copper, containing 0.6 troy ounces of actual silver. Most have the standard voyageur design by Emanuel Hahn although 1939, 1949, 1958, 1964 and 1967 have other commemorative designs. For many of the common dates average examples are only worth their silver value and the cost of handling them means I cannot list those here, although in my store I sometimes have silver value examples available. In 1911 the first Canadian silver dollars were struck but they only made four examples were made as patterns to show Parliament what they might look like. No further examples were issued for circulation. Only two of the four examples are known to still exist and only one of those is in private hands. As patterns they should not be considered "Coin of the Realm" and under the laws of that time would have no legal tender status. 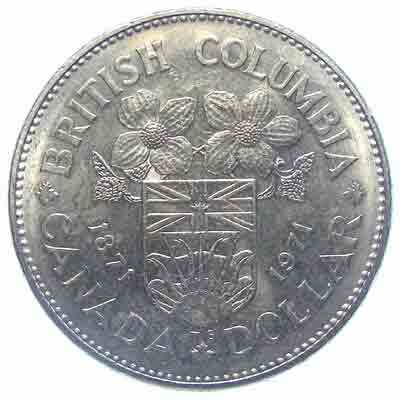 Canada's first official circulating silver dollar was issued in 1935. 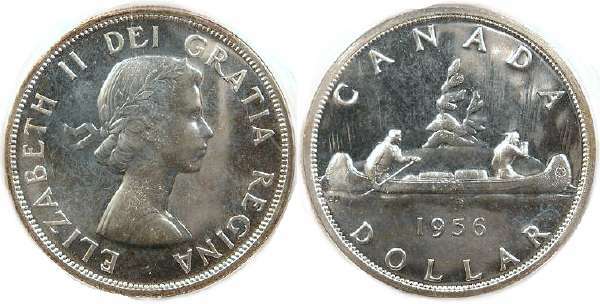 The reverse depicts Emanuel Hahns design of a voyageur and native American in a canoe before an island, which remained the design on most Canadian $1.00 coins until 1986. The obverse portrait design by Percy Metcalfe depicts a crowned bust of George V with the inscription "GEORGIVS V REX IMPERATOR ANNO REGNI XXV", Latin for "GEORGE 5th, KING AND EMPEROR FOR THE 25th YEAR", which refers to his 25th anniversary as King. His title as Emperor refers to his position as Emperor of India. Some examples have clear doubling in parts of the obverse inscription, as listed and illustrated in the 2010 edition of the Charlton Standard catalogue. Obverse 002 has strong doubling on the sides of "XXV". Obverse 4 has fainter doubling on the top of "REX". A short water line variety also exists. While similar to the 1935 dollar, the obverse is a slightly different one by Sir. E. B. MacKennal and the inscription now reads "GEORGIVS V DEI GRA REX ET IND IMP", Latin for "GEORGE V BY THE GRACE OF GOD KING AND EMPEROR OF INDIA". 1937 saw George VI on the throne so while the reverse design remains the same as 1935 and 1936, the new obverse by T. H. Paget shows the bust of George VI facing left with "GEORGIVS VI D G REX ET IND IMP", Latin for "GEORGE VI BY THE GRACE OF GOD KING AND EMPEROR OF INDIA". This design was used until 1947 other than for 1939. You will see references to double, triple and even quadruple HP for various dates. HP are the initials of designer H. Paget and appear below the lower right of the portrait. The multiple punching is how the initials are sometimes punched into the die. When a multiple HP is present I will mention it, and any coin where we do not will have a single HP. You will see references to short water lines (SWL) which refers to the water lines just in front of the canoe and which normally touch the canoe. When they are shorter it means there is a gap between them and the canoe, resulting from die re-polishing. 1938 dollars right out of the original bank rolls are often slightly scruffy looking, and often have weak rims. The rims are due to strike, but the scruffy surfaces suggest little care takes in mint handling procedures prior to them being shipped to the banks to be rolled. As this is normal for them, and grade is relative to what is normal, grading of 1938 dollars in MS-60 to MS-64 is a little more lax then for other dates and even then finding one that grades MS-64 or higher is difficult. 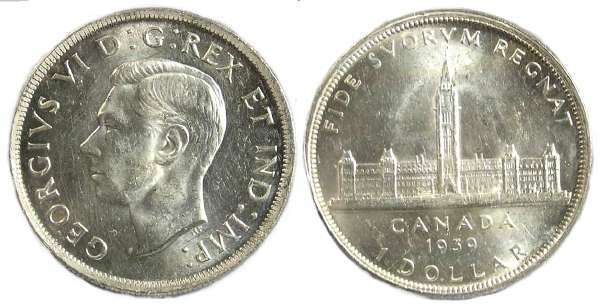 The dollar for 1939 is again by Emaneul Hahn showing the Parliament buildings in Ottawa with "FIDE SVORVM REGNAT" meaning "He reigns by the faith of his people", around. This commemorates the Royal by George VI and Queen Elizabeth (Queen mother to the current Queen Elizabeth). No silver dollar were issued during world war II from 1940 to 1944. After start again in 1945 they were issued every year until 1967. Starting in 1968 circulating dollar coins were struck of nickel. 1947 dollar comes with two different shaped 7's. The Blunt 7's tail points almost straight down, slightly to the left. The Pointed 7's tail has a distinct curve pointing down and slightly to the right. A somewhat scarcer variety is the Point Dot variety which has the pointed 7 with a small dot to the right of the point. The dot on these coins is in nearly the exact spot where the maple leaf occurs the next year, and some people believe it was put there to mark where to put the maple leaf, but this seem unlikely. Others believe the dot is die deterioration, however many of the 1947 Specimen sets have a point dot dollar in them, and there should not be any die deterioration on Specimen coins. What does appear to be the case, is that the 1947 point dot circulation strikes are the result of a specimen die put to use for business strikes. Because India received its independence in 1947 "IND IMP" (India's Emperor) had to be removed from all British Commonwealth coins dated after 1947. The new designs were prepared in England and those for Canada were not ready until late in 1948. 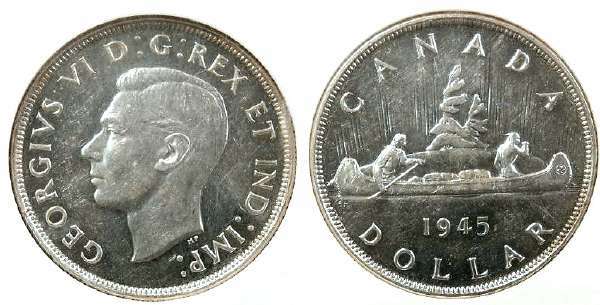 New coins were needed so for the first part of 1948 coins were struck dated 1947 with a small maple leaf after the date indicating minted in 1948. All 1947 maple dollars are of the blunt 7 variety. The new obverse design, again by T. H. Paget, arrived late in 1948 and was used until 1952. The inscription now read "GEORGE VI DIE GRATIA REX" (Latin for "George 6th, by God's Grace King") and with deeper hairlines making the coins look sharper in mint state than earlier dates. This affects how the coins look in all lower grades and one cannot use the same grading standard for 1948 to 1952 dollars as for 1937 to 1947 dollars. They would have to wear to VF-30 before the hair looks a muted as it does on uncirculated examples of earlier dates. 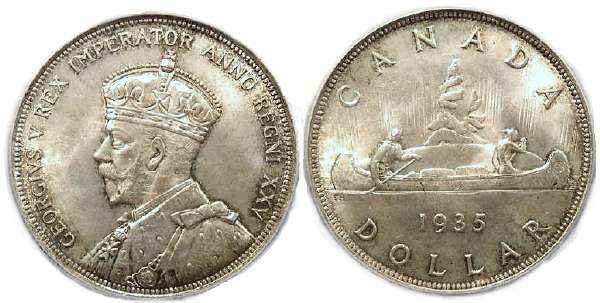 With a mintage of about 18,600, the 1948 dollar is the rarest Canadian circulating silver dollar. Recognized as rarities by 1950, most surviving examples saw little if any circulation and while the scarcest date they are easier to find in top quality than are 1945 and 1947 and are only more expensive than those dates because of their popularity. 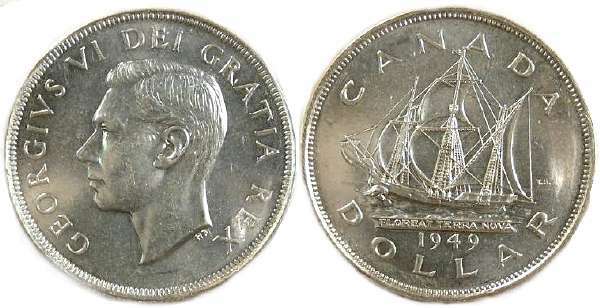 In 1949 to commemorate Newfoundland's entry into confederation as the 10th province, silver dollars were issued depicting John Cabot's ship the "Matthew" in which he first visited Newfoundland in 1497. These coins commonly show up in high quality for two reasons. First, they were interesting attractive coins which many people saved rather than spent. Second, unlike most other Canadian dollars which were mint shipped to the bank in bags, these were shipped in paper tubes which stopped them from bang together in the bags. 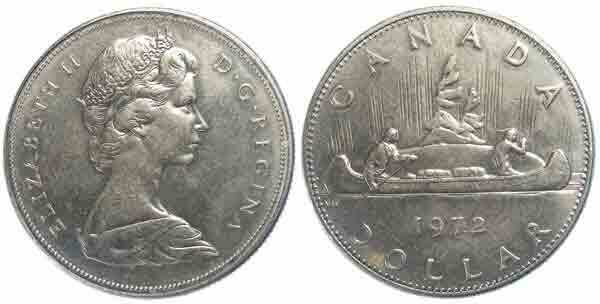 1949 dollars are the least expensive Canadian silver dollar in MS-65 and the only date commonly found in MS-66. Because of the high demand for them the mint struck just over 40,000 1949 dollars in early 1950. I am not aware of any other year for which minting continued into the following year. In 1950 the regular voyageur reverse design was resumed. During the early and mid-1950's, silver dollar dies were often re-polished to extend their use, weakening or removing some of the water lines in front of the canoe, resulting in varieties some of which are in the standard references and thus collected, and some are not. Regular water lines - The Island in front of the canoe is fully attached to the canoe, with three or four waters lines where at least one touches the canoe. You might have to turn it in the light a little to see if one touches. Short water lines - The Island in front of the canoe is at most weakly attached to the canoe with the top likely detached. There can be either three or four water lines but none (especially the top one) actually touches the canoe although it might come close. Arnprior - This is easier to tell because the Island in front of the canoe clearly does not touch the canoe, and there are only two clear water lines present, neither of which come close to touching the canoe. The bottom waterline will only be about half the length of the top one. I personally feel no trace of a third water line should be visible but I have noticed some certified examples do have a trace of the third water line. The 1951 dollar comes in the same varieties as the 1950, but it is even more difficult to differentiate some examples between regular and short water line, but looking at how the Island attaches to the canoe helps. When it is a close call, I will listed it as a regular water line type. The Arnprior is still pretty clear with only 1 1/2 water lines present and the lower one much shorter than the upper, except that on the Proof-like examples a trace of a third water line is allowed. The 1952 dollar comes in regular and short waterline as with the 1950 and 1951 dollars, but on the examples with heavier die polishing the water lines were completely removed so there is a no water line variety rather than a 1 1/2 water line Arnprior type. Examples of the no waterline variety often exhibit moderate to heavy die polish lines in the fields which can reduce the look of lustre even on high grade examples. You may note that there are many dates of the 1953 to 1967 dollars which we often not have available. This does not mean they are rare or scarce but in fact for many of the dates they are so common that at today's high silver prices ordinary ones even in mint condition are often worth more for their silver than any collector value. Thus only for scarcer varieties (as noted below) or for higher than usual quality examples, do we list them here. If you can into our store we often have them available in our scrap silver bin where we sell them for the price of the silver plus GST (we do not sell those by mail). The term "Arnprior" was first applied to 1955 silver dollars with only one and a half water lines in front of the canoe, with no trace of a third waterline visible. Some references state that there are 2 1/2 water lines but are confusing the bottom of the island with a water line. The first examples noted were among 2000 1955 dollars struck by special order for a business in Arnprior Ontario, which handed them out as Christmas bonuses. A used reverse die had been polished, a process that removing some of the waterlines leaving only 1 1/2 visible. That die was used with two different obverse dies, one with a small crack between the "T" and "I" of "GRATIA", the other a fresher die without any die cracks. Arnprior dollars with the die crack are the more desirable and command higher prices. It is commonly accepted that all 1955 dollars with that obverse die crack will be of the Arnprior variety, but that is incorrect as I have seen a number 3 water line 1955 dollars with the die crack weak but visible both in Proof-like sets, and circulation strikes. Proof-like Arnprior dollars do exist but only without the die break. As per the details above, the 1955 dollar comes in three recognized varieties. Regular water line, 1 1/2 water line (Arnprior) without die break and 1 1/2 water line Arnprior with die break. A fourth variety not listed in the standard references has short waterlines with traces of a third waterline visible. It is peculiar short waterline dollars are listed for 1950 through 1954, but they are not for 1955. While silver dollars were never a widely circulating denomination in Canada, by 1955 their circulation had nearly stopped examples from 1956 to 1967 will normally be in mint (MS) condition or very close to it. Examples grading below AU-50 are very unusual and typically are coins carried as lucky coins, without actually circulating. The one exception to this appears to have been the city of Regina in Saskatchewan where a friend of mine lived in the 1960's and tells me it was the one place both silver dollars and half dollars were commonly circulating into the mid 1960's. Unlike other dates in this series, 1957 dollars do not occur with a strong cameo effect and those rated as cameo will only be a weak cameo effect. Only recently has ICCS began to certify any 1957 dollars as being cameo. 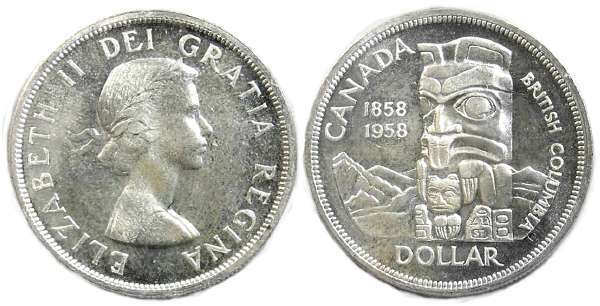 The 1958 100th anniversary of British Colombia becoming a British Territory was celebrated with a silver dollar depicting a beaver Totem Pole of the BC coastal natives. I have heard it said this is a "Death Totem" and many native North Americans refuse these coins, but as far as I can see there is no truth in this. The beaver represents a strong sense of family and home, the power of working towards goals and achievements, and an understanding of the power in nature and working in harmony with it. In 1964 silver dollars were issued to commemorate the 100th anniversary of the Charlottetown Conference where, in 1864, the negotiations were started that led to Canadian Confederation as a distinct country. Some 1964 dollars are missing the "dot" between T and S of the designers initials. 1964 dollars exist as specimen strikes from official specimen sets, and with deep cameo, very good strikes, and without the fine dimpling on the shoulder as seen on Proof-like strikes. These are fairly rare, and without question the most beautiful of 1964 dollars. Examples certified by ICCS will be described as SPECIMEN and those by PCGS as PROOF, but both are describing the same thing. I suspect specimen is correct but they certainly look like Proof's. In 1965 Queen Elizabeth's portrait was updated to a more mature look wearing a tiara. This portrait remained in use until 1989. There are 5 varieties of the 1965 dollar, depending on the size of the beads around the head, and if the 5 has a blunt or pointed end at the bottom of the curled. 1965 dollars exist as specimen strikes from official specimen sets, and with deep cameo, very good strikes, and without the fine dimpling on the shoulder as seen on Proof-like strikes. These are fairly rare, and without question the most beautiful of 1964 dollars. Examples certified by ICCS will be described as SPECIMEN and those by PCGS as PROOF, but both are describing the same thing. I suspect specimen is correct but they certainly look like Proof's. TYPE 1 - POINTED 5, SMALL BEADS - common in both circulation strikes and mint (PL) sets. TYPE 2 - BLUNT 5, SMALL BEADS - common in both circulation strikes and mint (PL) sets. TYPE 5 - POINTED 5, MEDIUM BEADS - slight scarce in circulation strikes, does not exist in mint (PL) sets. Most easily identified by the small jewel at the back of the head being slightly detached from the head (only type 5 type is like that). 1966 dollars come with either large and small beads on the obverse. Large bead examples are very common and all but the nicest examples are only worth their silver content. Small bead examples are extremely rare. To tell the difference, look at the A in REGINA. On common one it points at the left edge of a bead, while on the rare small bead it points between two beads. All 1966 small bead dollars have a Proof-like mirror finish so if your coin has a typical slightly matte MS finish you don't need to look at that A. With a Proof-like but not found in PL sets, ICCS grades them as MS but PCGS as PL, but they are both describing the same thing. These examples below are the common large bead unless otherwise noted. 1966 dollars exist as specimen strikes from official specimen sets, and usually have a very deep cameo, with very good strikes lacking the find dimpling on the shoulder seen on Proof-like strikes and are rare like this but the most beautiful of 1966 dollars. When such coins are certified by ICCS, ICCS calls them SPECIMEN but when certified by PCGS they are called PROOF, but both mean the same thing (I believe specimen is correct). In 1967, to celebrate Canada's 100th anniversary as a country, all circulating coins depicted animals common to Canada, with a flying Canada goose on the silver dollar. Please note the examples offered here are exceptional examples, either Proof-likes, Specimens or high end MS examples, but normal examples even in MS-60 to 62 are very common and only worth the value of the silver they contain, so we do not list them here. For most cameo coins only the portrait side is where the cameo effect is important. 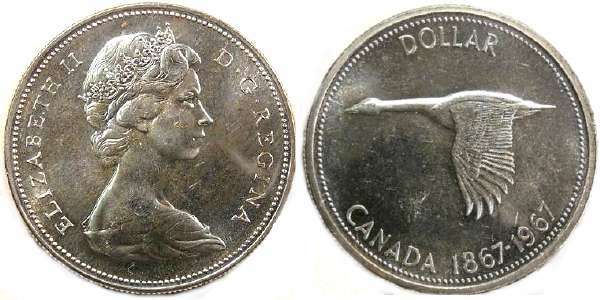 For 1967 coins the cameo effect on the animals is important to some collectors, so for these we will note if the cameo is on Canada Goose as well. Some 1967 dollars have a reverse rotated about 45 degrees and are known as the Diving Goose dollar. While these are struck to PL quality, they are not found in the mint sets. The 1967 dollar was the last circulating SILVER dollar, replaced in 1968 similar dollar coins struck of nickel with no silver content. A listing of the nickel dollars will be found further below. From 1968 to 1970 no actual silver dollars were struck and all dollar coins of those dates are of nickel. In 1971 actual silver dollars were again struck for the collector market, usually with commemorative designs and never intended for circulation. Silver examples are 36 mm (nickel ones are only 32 mm) and from 1971 to 1991 were 500 fine (50%) silver and 50% copper containing 0.375 ounces of silver. From 1992 to 2002 and 2007 to present they are sterling (92.5% silver, 7.5% copper) containing 0.75 ounces of silver. From 2003 to 2006 they were pure (99.99%) silver containing 0.81 ounces of silver. From 1971 to 1980 were all struck in specimen quality sold either as single coins in black imitation leather boxes, or included in the double dollar black leather box sets. In 1981 they begin to strike these in both Brilliantly Uncirculated (BU) and Proof quality (mirror fields with frosted images) with BU coins sold as single coins in hard plastic cases, and Proof coins as single coins in black leatherette boxes or included in the boxed leather Proof sets. In later dates a variety of other packaging was tried for the proof single dollars. The examples we offer have been removed from their boxes or proof sets which are thick and thus expensive to ship, and put into other packaging thin enough to be shipped less expensive to ship. If you require the original boxes I can often ship in them extra shipping will be added to the order. If you need the original boxes, please let me know when you place your order. My selection of available dates changes constantly and I cannot keep this part of my website up to date to it. If there is a date or dates you are looking for please contact me about price and availability. Most dates of the 500 fine series from 1971 to 1991 will generally be in the $12.00 to $15.00 range. Newer dates in the sterling and pure series after 1991 will usually be between $21.00 and $50.00 with some of the special commemorates sold only as single coins higher. Generally the newer the date the higher in that range they will be. The list below is just to tell you what dates and types I sometimes have in the store. Voyageur design used from 1968 to 1987. The following 1968 to 1987 dollar coins are struck in pure nickel and at 32 mm are smaller than the 36 mm actual silver dollars made during this same period. They will also attract to a magnet while the silver ones will not. During this period may dates are the standard voyageur design, but others were special commemorative's. We will note the special commemorative's in their listings, and if such is not noted you can assume it is the voyageur design. From 1968 to 1980 these come as standard circulation strikes (MS, AU, XF, etc) which were issued in rolls through the banks, Proof-like quality strikes issued in the standard official poly-pack Proof-like sets (selected very nice coins), and Specimen strikes which were double struck to give them sharper images and higher lustre and which were issued in both the double dollar black leather box sets, and special specimens sets which in early years were in red leatherette double penny sets, and later years in the hard blue boxed sets. From 1981 to 1986 they still come as standard circulation strikes to issue through the banks, proof-like strikes in the standard poly-pack PL sets, specimen strikes in the blue boxed sets, but in the double dollar black leather box sets they changed to Proof strikes which have mirror like fields and frosted images. A few special commemorative's were also issued in either proof and/or specimen strike in various types of single coin boxes. 1987 is different because there are no circulated strikes, but rather only Proof-like, specimen and Proof strikes in the sets. As with the cased silver dollars, these nickel dollars from sets or issued with boxes will not be shipped without the boxes as it makes the shipping costs too high (and those from sets have to be removed from the sets). We don't have capsules for most of these so they will be in standard card 2x2's. 4) DOUBLED HORIZON AND WATER LINES. 5) EXTRA WATER LINE (above the regular ones, and found only in PL sets). 6) DOUBLE DIE REVERSE (parts of date and inscriptions heavily doubled). I have noticed many 1968 proof-like dollars have flan defects as parallel horizontal lines into the flan, that were on the flans prior to striking. I will select specimens to offer below that have as few of these marks as possible (hopefully none) but if you are interested in one that has such marks clear and strong, please let me know and I can select for that feature. 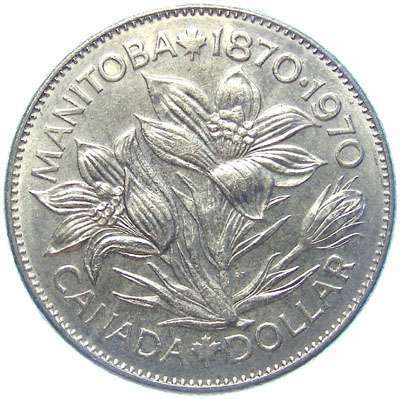 The 1970 nickel dollar commemorates the 100th anniversary of the Province of Manitoba's entry into Canadian confederation, and shows official Provincial flower of the prairie crocus. The standard Queen's portrait is on the obverse. All examples of this type are made of nickel. Mint state (abbreviated MS) which are coins struck for issue through the banks and have average lustre and surface qualities. In most cases MS coins have little value unless in the highest range of the MS coins, and those are seldom seen. We don't list most dates in MS because they are not of high enough value to justify the time and trouble to list and/or ship them. Specimen (abbreviated SP or SPEC) which were in the black leather double dollar sets from 1971 to 1980, and for later dates in various types sets. 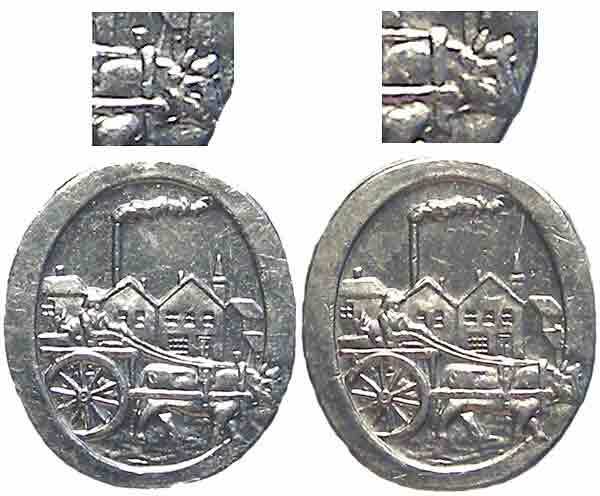 Like PL coins they are struck from dies in their freshest die state but differ in being double struck to give them a higher lustre and sharper images, and they do not go through any mint handling processes before going into the sets so are nearly mark free. The rims tend and edges tend to be a little sharper although this is not obvious on a casual inspection. When we list a coin as being a specimen, it is because we personally took it from a specimen set before listing it here. The 1971 nickel dollar commemorates the 100th anniversary of the Province of British Columbia's entry into Canadian confederation, and shows the Provincial crest with the Provinces official flower of the Dog Wood above. The standard Queen's portrait is on the obverse. These nickel examples are only 32 mm, but the same design was also struck in 500 fine silver at 36 mm. 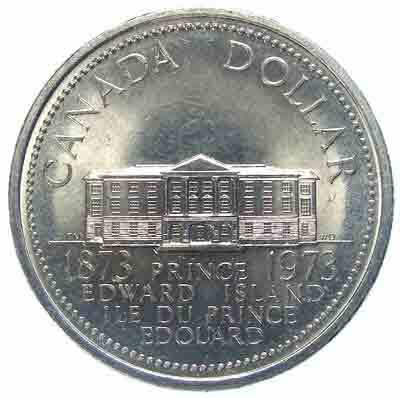 The 1973 nickel dollar commemorates the 100th anniversary of the Province of Prince Edward Islands entry into Canadian confederation, and shows the provincial legislature building. The standard Queen's portrait is on the obverse, although it uses a slightly modified "small bust" design as one also see's on the 1973 quarters. These were only struck of nickel. 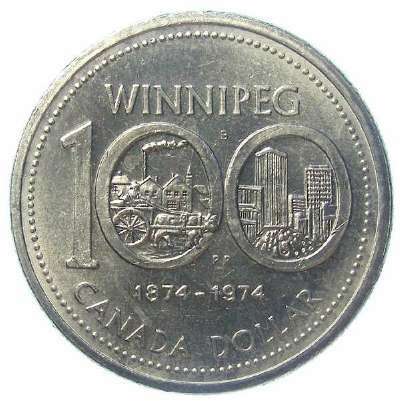 The 1974 nickel dollar commemorates the 100th anniversary of Winnipeg. This is one of the few years same type was also struck in nickel and silver but the silver ones are larger. Inside the left 0 there is a Red River cart where most examples have a single upright on the oxen's yoke, but a few have a double yoke. 1974 nickel dollar, double yoke details on left, single yoke on right. From 1975 to 1981 only voyageur design nickel dollars were struck although there were minor changes in the design. In 1977 the denticle border around the reverse was replaced with a beaded border but only for this year as the denticle border resumes in 1978. Starting in 1977 and continuing on until the series ends in 1987, the northern lights behind the voyagers change from recessed lines to raised lines. 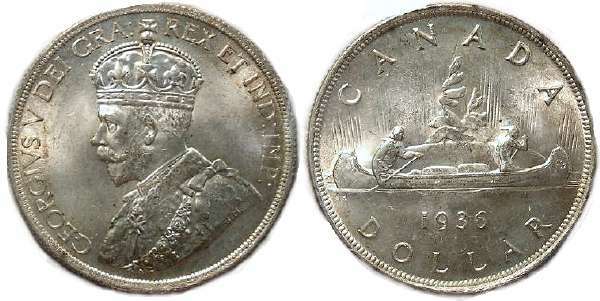 1977 nickel dollars have three varieties based on the length of the water lines in front of the canoe and if the first jewel at the front of the Queen's crown is attached or detached. Most examples will be detached jewel with long water lines. The Canadian Coin News trend sheet show all three types existing in circulation (MS) strike, but only type 2 (detached jewel, short water lines) in Proof-like sets, but the Charlton Standard Catalogue shows all three in both circulation and proof-like strikes which I believe to be correct. 1982 nickel dollars come in two types, standard voyageur design and a constitution commemorative design, both of which were issued for circulation. PL, specimen and Proof sets have the voyageur design, but specimen examples of the constitution type were sold as singles. The constitution types has a modified obverse with a smaller Queen's head, and an inscription reading "CANADA 1982 DOLLAR" above and "ELIZABETH II" below. 1984 nickel dollars come in two types, standard voyageur design and a Jacques Cartier type commemorating his landing at Gaspe, Quebec, both of which were issued for circulation. PL, specimen and Proof sets have the voyageur design, but Proof examples of the Cartier type were sold as singles. 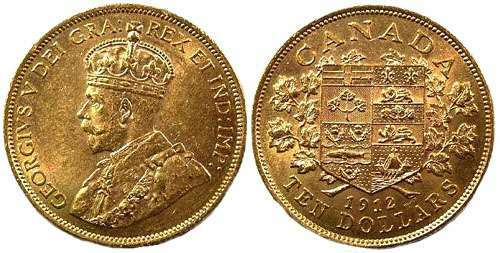 The Cartier types has the same modified obverse as the 1982 Constitution type with a smaller Queen's head, and an inscription reading "CANADA 1984 DOLLAR" above and "ELIZABETH II" below. 1987 nickel dollars are only found in Proof-like, Specimen and Proof sets. Aureate-bronze plated nickel Loon dollars were the coins issued for general circulation this year. The aureate-bronze plated nickel Loon dollars was introduced in 1987 to replace both the older nickel dollars and the paper $1.00 bill. The obverse design of the Queen wearing a tiara was by Arnold Machin. The swimming loon reverse design was a joint effort of Robert Carmichael and Terrance Smith. As soon as they appeared people started calling them "loonies" which has stuck to this day. Some years saw special commemorative designs which will be discussed in the listing for those years. The coins were introduced at 7.0 grams, 26.72 mm diameter and 1.95 grams thick and are bronze plated over pure nickel cores totalling 91.5% nickel and 8.5% bronze. In 1988 the size was reduced to 26.5 mm by 1.75 mm without reducing the weight and while I have not done the measurements to find out how they managed to reduce both the diameter and thickness without reducing the weight, but I assume the designs and rims are lower relief making the body thicker. Only slightly heavier and larger than a quarter they were easily mistaken for a quarter when pulled from one's pocket by feel alone, so they were made 11 sided with a smooth edge which allowed anyone, including the blind, to easily differentiate them. All examples I offer, including those in Proof or Specimen quality, are mounted in standard 2x2 card holders unless otherwise specified. In 1987 Loon dollars were the first of this series and were issued in bank rolls (MS) quality, as well as single coins in Proof finish. Proof, specimen and Proof-like sets for 1987 have a voyageur design nickel dollar. A new obverse design by Dora De Pedery-Hunt and Ago Aarand was introduced in 1990 and used until 2003, showing Queen Elizabeth wearing a diamond diadem and necklace. The reverse design remained the same as in 1987. Two designs were issued in 1992, one with the normal swimming loon but with the double date as 1867-1992 below the loon to commemorate Canada's 125 anniversary as a country, available in MS as well as Proof-like, Specimen and Proof quality. The second showed three children seated on the ground in front of the Parliament buildings and comes in MS for circulation, proof-like (the Charlton listing that does not list these in PL which is an error as they are in the PL quarters sets), and in proof (in some of the proof sets). 1994 saw two different loon dollar designs, both issued for circulation. The first has the standard swimming loon and is found in all striking qualities of MS, PL, Specimen and Proof. The second depicts the national War Memorial in Ottawa, struck only in MS and Proof finishes. 1995 again saw two different designs for circulation. The first has the standard swimming loon design issued in all striking finishes. The second commemorates the 50th anniversary of the founding of the United Nations and Canada's service as UN peace keepers and depicts the Peacekeeping Monument in Ottawa which had been unveiled three years earlier. The peacekeeper design was struck only in MS and Proof finishes. 1996 saw a return to the standard loon dollars in all striking styles. From 1997 to 2001 no dollar coins were struck for circulation but are available from mint sets. 1997 loon dollars are in normal cellophane Proof-like sets and Proof sets. Those struck at Winnipeg have even lustre over the entire surface while those struck at Ottawa have a slightly lined background and light frosting on the lettering around the loon. The 10th anniversary flying loon is found in specimen sets and some red card Proof-like sets but I see no difference between them. I designate the striking style only if I take them from the set myself, and any that come to me already out of a set I call proof-like. I price both the same. In 1998, the Mint put a "W" mint mark below the Queen's head on coins minted at Winnipeg, although those were all in proof-like sets. Later in the years the minting of these sets was moved back to Ottawa where no mint mark was used. Thus proof-like brass (aureate) dollars are found both with and without the "W" mint mark. All circulation (MS), specimen and proof coins were without mint mark. The finish on 1998 proof-like coins returns to high luster finish, while specimen coins retain the slightly matte finish fields with high lustre designs that first appeared in 1996. 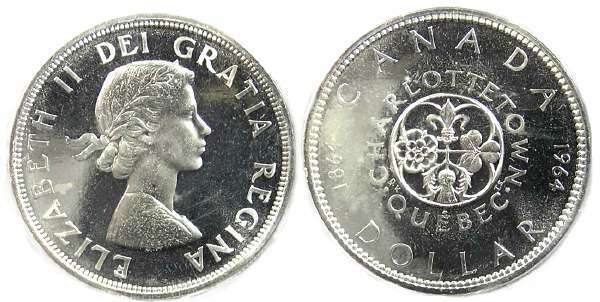 To commemorate Queen Elizabeth's 50th anniversary as Queen in 2002, nearly all Canadian coins including these $1.00 coins were struck with the date moved to the obverse below the Queen's head, shown as "1952 2002". To commemorate the 15th anniversary of Loon dollars a special design showing a family of loons swimming with the male doing a "loon dance" was put in all specimen sets. Early 2003 coins used the same tiara (crowned) head obverse as previous years and were struck at Ottawa without mint mark in MS, PL, Specimen and Proof. Later in the year a new Queen's portrait by Susanna Blunt and Susan Taylor was adopted using an uncrowned Queen's Portrait appears on all later coins. The new portrait coins were struck at Ottawa without a mint mark only in MS quality for circulation, while Proof-like sets were made at Winnipeg with the "W" mint mark. Four different brass dollar designs were issued in 2004. The regular loon design was struck in MS, PL and Proof, and an Olympic Flame loon was issued in only in MS and as a colored sterling silver Proof known as the "lucky Loon". A flying Canada Goose design was included in specimen sets. A design called the "elusive loon" showing a loon seated on it's nest and known as the elusive Loon was struck in specimen quality and sold through the post offices in a wood box which included some stamps (it is well named as they are difficult to find). Three brass dollar designs were issued in 2005. The standard swimming loon was issued in MS for circulation as well as in PL and Proof sets. A Terry Fox commemorative design was issued only for circulation so MS (we list them here as UNC for uncirculated taken directly from a mint roll), and comes in two varieties depending on how strong the grass next to his feet shows, although the type known as the "no grass" as actually just weak grass. A Puffin reverse was in the specimens. Starting in 2006 the mint went crazy with designs on Loon and loon related dollar coins. In 2009 alone there are at least 15 different designs, and more if you count different striking qualities and different alloys, but most were never issued for circulation so are on in mint sets. From here on I will only discuss the basic designs issued for circulation and the standard mint sets. When I have them I will list examples of other design, but I will not discuss them in my discussions of each date. 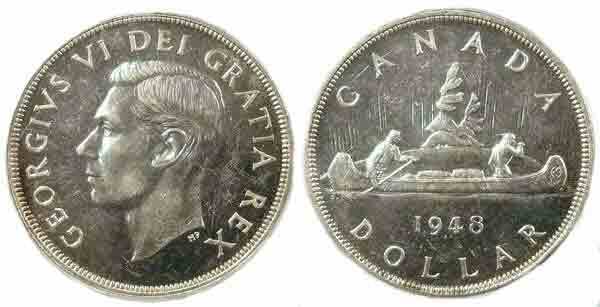 The regular loon design struck in MS, PL and Proof with the earlier year examples with nothing below the Queen's head. Later examples were struck in MS and PL with the Mint Logo below the Queen's head, with the PL examples in the special edition sets that had the Churchill $2.00 in them. An Olympic commemorative called the Loon Settling issued in MS only. A Snowy Owl reverse $1.00 is found only in specimen sets. In 2007 the standard Loon design issued in MS, PL and Proof, and a Trumpeter Swan design in the specimen sets. In 2009 with the regular loon issued in MS, PL and Proof quality, a 100th anniversary of the Montreal Canadians design issued only in MS quality. A Great Blue Heron design was in the mint sets. In 2010 saw more than the usual number of types issued in MS quality for circulation. The regular loon was issued in MS, PL and Proof quality. A 100th anniversary of the Canadian Navy design issued only in MS quality. A 100th anniversary of the Saskatchewan Rough Riders issued in MS quality. A Vancouver Olympic design issued in MS quality. A Northern Harrier design was in the specimen sets. In 2011 the mint stopped making intentionally superior quality coins for Proof-like (standard) mint sets, rather using normal MS coins that had not gone through all of the mint handling processes rolled coins go through. With is no way to differentiate between MS-63 or better coins from a set vs bank rolls, they should be priced the same with the prices reflecting how earlier dates from sets are priced. For all dates 2011 and newer, when available I will price the standard loon $1.00 types here at MS-63 @ $2.50. MS-64 @ $5.00. MS-65 @ $8.00. In 2011 saw only two design issued for circulation which included the regular loon issued in MS and Proof quality, and a 100th anniversary of parks Canada in MS quality. A Great Grey owl design is in the specimen sets. Part way through 2012 a major changed was introduced for the "loon dollars" and a reverse "security circle" of a depressed circle containing a small smooth maple leaf within a textured maple leaf replaced the obverse mint logo. These newer coins have a brighter gold colored finish that probably will better resist toning and the specifications are now brass plating over a steel core at 26.6 mm x 1.95 mm and 6.27 grams. For the early part of 2012 brass plated on nickel loons at the 1988 standard and with the reverse mint logo were issued in MS and proof. A Loon mother swimming with her chicks was in the specimen sets also at the 1988 specifications without the security circle. Later in the year The first "security" circle brass dollars appear at the new standard, with both a Grey cup and Olympic "lucky" loon design issued in MS.
For Canada's 150's anniversary celebration a commemorative brass dollar has been struck and a depiction of various objects from across Canada including a lighthouse, two trains, bridge, grain elevator, and part of the Parliament buildings. I got in some rolls of these, and those below are the nicest I could find in the first roll I opened (the coins over all were somewhat baggy). In 1994 and 1995 the Royal Canadian mint was experimenting with different shapes, alloys and weights for the proposed $2.00 coins that were eventually issued in 1996. Test tokens were made of various possibilities, with 17 different types now documented. The only type officially made for sale to the public were the 28 mm, 7.30 grams, 1.7 mm thick with interrupted serrations, bi-metallic tokens of the format that was eventually adopted for the $2.00 coins. In 1996 Canada discontinued the $2.00 bill, replacing it with a bimetallic $2.00 coin which has picked up the nickname "twoonie". Proof-like, specimens and MS strikes are normally a 99% nickel white outer ring, and a 92% copper, 6% aluminum, 2% nickel yellow inner plug. Most have a walking polar bear design although other commemorative designs exist in some years, which we will describe where listing them. Proof strikes are 8.83 grams of sterling (92.5%) silver containing 0.262 ounces of silver, with a 24 K thin gold plating over the center. Other alloys exist in 1996, as discussed below. Proof strikes in 1996 come in three alloys. Sterling (92%) silver weighing 8.83 grams, nickel-copper alloy weighing 7.30 grams and mix white and yellow gold weighing 11.40 grams. The coin examples have 22k stamped on the obverse although only the core is 22K and the outer ring is 4K with a total average of 12K and a gold content of 0.185 troy ounces. Pied fort (meaning double thickness) sterling silver proof examples were sold in a large fold over blue box contain the coin and two uncut $2.00 BRX prefix notes. In Proof-like quality the 1997 $2.00 coins were minted with two different finishes on the bear. Those with a mirror finish on the bear were struck at the Ottawa mint while those with a frosted finish were struck at the Winnipeg mint. No actual mint marks were put on the coins. In 1998, the Mint put a "W" mint mark below the Queen's head on coins minted at Winnipeg, although those were all in proof-like sets. Later in the years the minting of these sets was moved back to Ottawa where no mint mark was used. Thus proof-like $2.00 coins are found both with and without the "W" mint mark. All circulation (MS), specimen and proof coins were without mint mark. The finish on 1998 proof-like coins returns to high luster finish, while specimen coins retain the slightly matte finish fields with high lustre designs that first appeared in 1996. Two $2.00 designs were issued in 1999. Those issued in MS state for circulation were all a design Inuit drum dancer design also struck in PL, Specimen and Proof sets to commemorate the creation of the Canadian territory of Nunavut. A rare variety is missing the usual ring around the drum dancer, which should be present on a examples other than Proof quality (which never has it). The error results from a die cut for Proofs accidentally finished with a PL surface, and is known as the Nunavut "MULE ERROR" and is only found in Proof-like sets (unless otherwise noted, any were offer will be shipped as the intact set). The second type is the standard single bear design, which was not issued for circulation and is found only in Proof-like, Specimen and Proof sets. There are several types of Proof-like sets issued, in some of which the bear has a standard finish and in others a frosted bear finish. 2003 saw the change over from the old crowned head effigy to the new non-crowned effigy. Crowned head examples do not have a mint mark and are found in MS, Proof-like, Specimen and Proof strikes. The new effigy is found without mint mark in MS (circulation strike) examples, and with the W mint mark in special edition Proof-like sets and are the last coins to bare the Winnipeg mint mark. No proof or specimen strikes were made with the new effigy. Four distinct types and one variation of the $2.00 coins were issued in 2006. All have the standard non-crowned Queens head. Type one has a standard bear with the date as 2006 below the Queen's head and a small maple leaf above her head. This type was issued both for normal circulation and in mint sets. 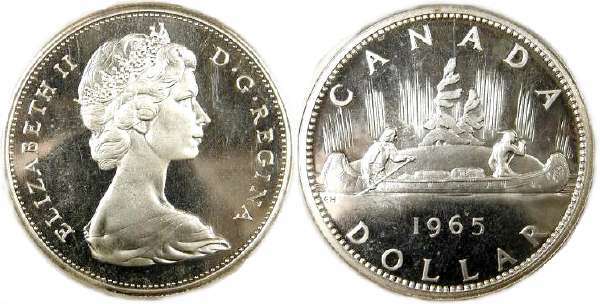 Type two has a standard bear type but a small maple leaf above the Queen's head and the 10th anniversary of the $2.00 coin date as 1996-2006 below her head. This type is found only in proof-like, specimen and proof sets. Type three has the northern Lights behind the bear with the 10th anniversary dates as 1996-2006 above the Queen's head, with the mint logo below, and is known as the Churchill Type. This type was struck for circulation at the Ottawa mint in a variety with two small wedges projecting from the top and bottom of the bear's ear, known as the Pixie ear type. It is also found in some proof-like sets struck at the Winnipeg mint but with a normal ear on the bear. Type four has a standard bear with the date as 2006 above the Queen's head and the small maple leaf above her head. This type was only struck for circulation. 2007 $2.00 coins are found in circulation (MS) as well as "non-circulating Mint State" or what we call "Proof-like". Those from the card holders (birthday sets, etc) tend to have a matte finish over the whole coin, and those in the soft plastic holders (standard mint sets, Olympic sets, etc) tend to have a mirror finish with a frosted bear. I will refer to these coins as matte and frosted as I list them, although I have not noticed a significant difference in rarity or value. 2008 $2.00 coins were issued with both a standard bear design, and a special 400th anniversary of Quebec City commemorative. The 2010 $2.00 coins are found either 14 or 16 serrations on each bank of serrations on the edge. Both types are found on circulation strikes the 14 serration type the rarer. All examples in the mint sets are 16 serrations, making them the more common of the two. In 2011 the mint stopped making intentionally superior quality coins for Proof-like (standard) mint sets, rather using normal MS coins that had not gone through all of the mint handling processes rolled coins go through. With is no way to differentiate between MS-63 or better coins from a set vs bank rolls, they should be priced the same, with the prices reflecting how earlier dates from sets are priced. For all dates 2011 and newer, when available I will price the standard bear $2.00 types at MS-63 @ $5.00. MS-64 @ $6.50. MS-65 @ $10.00. Two different $2.00 coins were issued for circulation in 2011, the standard bear, and a special Boreal Forest commemorative (which is the scarcer of the two). This is a complicated year for $2.00 coins. At the beginning of the year about 1.5 million $2.00 coins of the standard bear design, without laser security devices or edge lettering, were struck for circulation strikes (including those in standard mints), specimen and proof strikes. Later nearly 83 million were struck with laser security devices and edge lettering reading CANADA 2 DOLLARS, but only for circulation. 5 million additional coins depicting the ship Shannon were struck for circulation although some were in special 5 pack mint sets but with circulation strikes. A special wolf cubs design was also struck but only for a special issue specimen set. With only about 1.5 out of nearly 80 million examples the standard bear without security devices or edge lettering is by far the scarcer circulation type which is why it is the more expensive and difficult to find type. Proof examples come at 9 gram pure silver (non-magnetic) and 6.99 gram with nickel plated steel rings (magnetic) with brass plated aluminum bronze cores, making this the first proof $2.00 coins issued that were not solid silver. A special bear cubs design was used for some of the Specimen strike examples, using frosted backgrounds with polished designs for a reverse cameo effect. For Canada's 150's anniversary celebration a commemorative two dollar was struck depicting the northern lights over a lake, with examples struck in regular metal without color, and a glow in the dark version with a colored northern lights. The examples that glow in the dark with the colored northern lights appear to have been sprayed with something that causes some brown spotting in the gold colored areas on many examples. 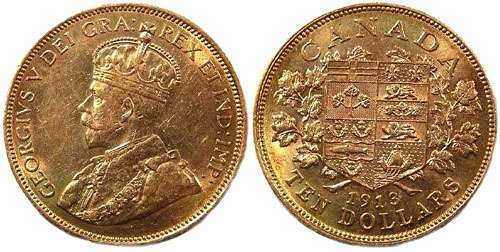 From 1912 to 1914 Canada struck $5.00 and $10.00 gold coins to the same purity and weight standards as American $5.00 and $10.00 gold coins. Both are of a 90% gold and 10% copper alloy, with the $5.00 21.6 mm and 8.36 grams, and the $10.00 16.7 mm and 26.92 grams. Other than the denominations below the date, they have identical design wither the obverse by E. B. Mackennal and the reverse by W. Blakemore. The Government of Canada was holding thousands of these coins ever since they were minted, which make them scarce in the market place. Recently the government sold much of those holdings and destroy many others when they refined them to recover the gold. The huge release, combined with lots of advertising created an interesting market for them, but also completely altered the supply to demand ratios for the various dates. This will have an effect on the long term prices, and we may find that the dates that were previously the rarest because they were nearly all still at the mint, are now of average rarity or even the commonest since the mint has released so many of them. It is currently not possibly to predict where they will eventually settle out although I will make my best guess below. Just looking at the mintages, the 1912 has the highest, 1913 middle and 1914 the lowest and that was reflected directly in the market up to the recent release. Because of the recent mint release it is like that the survival rate in circulated condition will still have 1912 the commonest, but in mint state it now likely 1913 is the most common, 1912 in the middle, but due to it's much lower mintage 1914 will probably still be the rarest but not by the same degree it use to be. Just looking at the mintages, the 1912 has the lowest yet the easiest to fine, 1913 middle and 1914 the lowest and rarest. The survival rate in circulated condition will still have 1912 the highest as those were released in 1912 and circulated. Due to the recent mint release of uncirculated coins, it is now likely the survival rate in mint condition will be about the same for 1913 and 1914 (they have similar mintage) and 1912 will be the rarest although since 1912 was never considered rare before, this means all three are now fairly common. 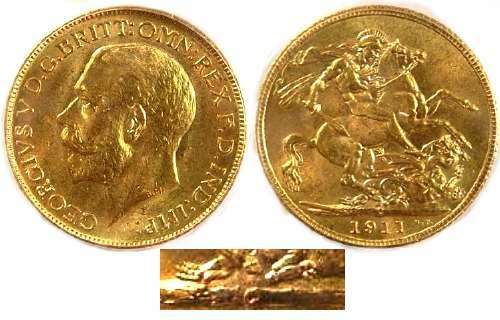 From 1908 to 1919 with the exception of 1912 and 1915, gold sovereigns were struck at the Royal Canadian mint with a "C" mint mark on the ground line below the horse's hoof. 1913 has the lowest mintage at about 3700, and 1916 is second lowest about just over 6000. 1913's show up but for unknown reasons very few (possibly less than 20) 1916 C sovereigns are now known to exist and it is not known what happened to the reset. The mint has no record of destroying them, and while some people think they were lost in a ship sunk during World War I, there is a possibility they are all sitting in some bank vault as just a bag of sovereigns and might come to light some day (as happened with the 1916 London mint sovereigns that used to be rare).